Nestled in the heart of Busto Garolfo, between the moorland and the irrigated plain near Milan, Villa Rescalli Villoresi is a wonderful seventeenth-century noble residence, built by the Rescalli family, counts of San Vittore Olona. The Villa, which proposes options typical of the villas of Piacenza and Parma, shows a U structure pointing towards the central square of the village, with whom it is scenographically connected through a path that forms a visual telescope that crosses the majestic gate of the court, the residence, and the monumental park. The building consists of a main body and a series of farm buildings located along the different courts surrounded by the wonderful English-style park that covers about 25,000 m2 of land. This is a sumptuous and elegant Villa that, with its multiple and versatile spaces, represents the ideal location for a refined, exclusive and unforgettable wedding. The Sala dei ricevimenti (Reception Hall), equipped with air conditioning and sound system, is adorned with elegant vaulted ceiling and a long window wall, which plunges itself into the vast green expanse of the park. The hall can host up to 150 people and represents the ideal location for a spectacular and elegant wedding banquet. The Sala principale (Main Hall) leads to the Sala rustica (Country Hall), which can host up to 70 people, in case of a cosier reception. There are also other cosy rooms, which can be used to divide the different phases of the banquet if needed. The noble Court, whose three sides are surrounded by a large portico with segmental arches, supported by elegant granite columns, can host up to 300 guests and it is the ideal scenario for the welcome aperitif in the shadow of the centuries-old trees, or for the dessert buffet enlivened by the romantic lighting of the garden at night. The country courtyards are evocative as well and represent an important evidence of the peasants’ daily life and activities carried out during the past centuries. Just think about the majestic press of 1792, a precious sign of the long wine-producing tradition in that area. The bride and the groom can exclusively enjoy the Villa and can change any scenario for their wedding, from the starter buffet at Corte delle carrozze (Coach Courtyard), to the cake cutting at Corte del torchio (Press Courtyard). The music pavilion in the park can be a perfect scenario for the lively after party to the sound of music. For a perfect finale, the Villa makes a nuptial suite available to the bride and the groom for their wedding night. Everything is supervised by a professional and qualified staff that meticulously take care of any detail regarding the management and the organisation of the wedding, in order to turn the best day of your life into an unforgettable dream. 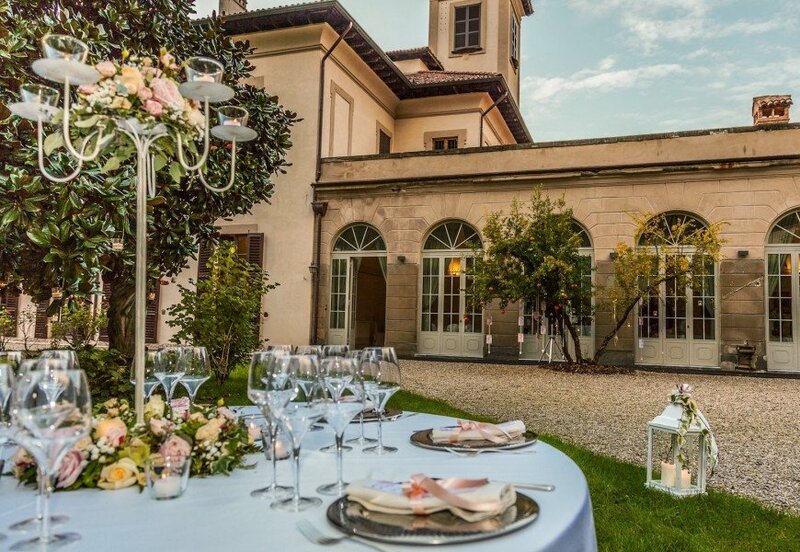 At Villa Rescalli Villoresi you can celebrate the civil ceremony with legal value. Villa Rescalli Villoresi has successfully passed the 100 Quality Controls established by the "Certification Protocol of Historic Houses of Excellence" and is properly certified by the ITALIAN REGISTRY OF THE HISTORIC HOUSES OF EXCELLENCE. The phone number of Villa Rescalli Villoresi is +39 3356867815. The fax number is 0331566370.